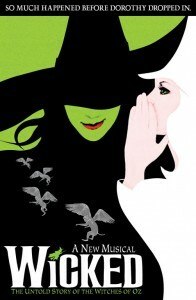 I have seen the musical Wicked three times. I love it. But I have not yet read the book that it was inspired by. It is on my to do list. I knew that their would be a movie based upon the stage show, but I feel like it will be a while. They aren’t gonna release the movie for everyone to see when they are still making bank on sold out shows around the country. Now it is being reported that ABC is developing a mini-series based upon the book Wicked: The Life and Times of the Wicked Witch of the West by Gregoy Maguire. Now you may ask how exactly do you make a two and a half hour musical into an eight hour mini series. Well the mini series will be an adaptation of the book, which from what I have heard is much more political and darker than the musical. And it’s song and dance free. The movie is still in the works over at Universal, but I am sure it will be ahile before we see that. Erik Jendresen of Band of Brothers will be in charge of writing the script. What do you think of this? Would you rather see the mini series or the movie musical? Let us know in the comments below.